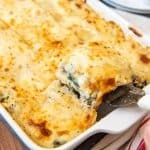 Layers of lean ground chicken and mushrooms, spinach, a creamy white sauce, lasagna noodles, and cheese, make this White Chicken Spinach Lasagna a bit lighter than the traditional version while still being loaded with delicious, comforting flavor! In a large saucepan, melt the butter over medium heat. Add the chopped onion and garlic, and cook until softened, about 3-4 minutes. Sprinkle the flour over the softened onions, then stir to combine, cooking for another 1-2 minutes. Whisk the chicken broth and milk into the onion and flour mixture, then stir constantly until the sauce simmers and thickens, about 4-5 minutes. Stir in the basil, oregano, salt, and pepper, then remove from heat. Bring a large pot of salted water to a boil, then cook the lasagna noodles according to package directions. Drain and lay out in a single layer on a baking sheet sprayed with cooking spray so they don't stick. In the same pot, add 1 tablespoon of the olive oil and heat over medium-high heat. Add the spinach and cook for 3-4 minutes until wilted. Drain in a colander, squeezing out as much excess water as possible. In a large pan, heat the remaining tablespoon of olive oil over medium-high heat, then combine the ground chicken and mushrooms and brown together until the chicken is cooked through. Drain off any liquid. To assemble, spread 1/4 of the sauce on the bottom of a large 9x13-inch baking dish. Lay 3 of the cooked lasagna noodles on top. Layer on 1/2 of the chicken & mushroom mixture, then spread 1/2 of the wilted spinach on top. Dollop with half of the ricotta cheese, then spread with another 1/4 of the sauce. Sprinkle with 1/3 of the mozzarella and Parmesan cheeses. Repeat layers by first arranging 3 more of the lasagna noodles over the first layer, then topping with the remaining chicken & mushroom mixture, spinach, ricotta cheese, and another 1/4 of the sauce and 1/3 of the mozzarella and Parmesan cheeses. Finish the lasagna by arranging the last three noodles on top, then spread with the remaining sauce and sprinkle with the last of the mozzarella and Parmesan cheese. Bake at 350 degrees F. for 35 to 40 minutes until hot and bubbly, finishing under the broiler just to add a little color to the top, but being careful not to burn the cheese. Let the lasagna stand for at least 5-10 minutes before slicing and serving. Sprinkle with freshly chopped parsley, if desired. You could use 1 package of frozen spinach in place of the fresh spinach. Just defrost and squeeze out as much water as you can. Lasagna can be made 1 day in advance and refrigerated. Just add 15 minutes to the baking time and cover with aluminum foil for the first 20 minutes of baking time. You can also freeze the lasagna and bake for 2 hours until hot through, keeping the lasagna covered with aluminum foil for the first 1 hour and 15 minutes.